Using data from 49 states and Washington, D.C., we analyzed changes in costsharing under health plans offered to individuals and families through state and federal exchanges from 2014 to 2015. We examined eight vehicles for cost-sharing, including deductibles, copayments, coinsurance, and out-of-pocket limits, and compared findings with cost-sharing under employer-based insurance. 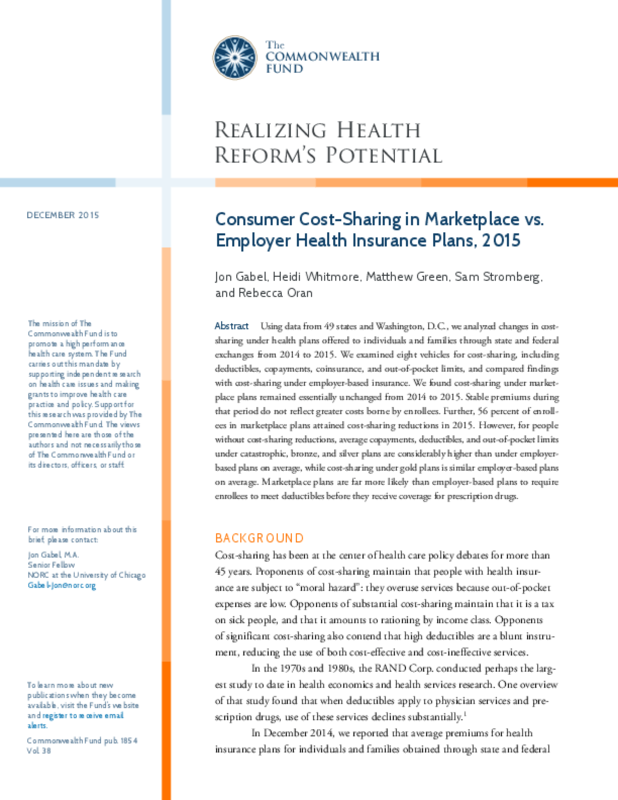 We found cost-sharing under marketplace plans remained essentially unchanged from 2014 to 2015. Stable premiums during that period do not reflect greater costs borne by enrollees. Further, 56 percent of enrollees in marketplace plans attained cost-sharing reductions in 2015. However, for people without cost-sharing reductions, average copayments, deductibles, and out-of-pocket limits under catastrophic, bronze, and silver plans are considerably higher than under employerbased plans on average, while cost-sharing under gold plans is similar employer-based plans on average. Marketplace plans are far more likely than employer-based plans to require enrollees to meet deductibles before they receive coverage for prescription drugs.